When embarking on the fun project of decorating a nursery, it’s often the functional items that get neglected. We like to focus on all items with equal energy and care, so yes, that side table you need next to the glider or rocker to hold the bottle for late night feeds, the book for late night reads or the wipes for little (and not so little) messes is an important part of the room design. It can often be a fun accent or a fanciful find, but we always keep the function in mind. We love West Elm’s Martini Side Table; it’s a burst of color and a sturdy table. There are other colors available, but we’re a little wrapped up in summer’s bright colors right now. Bungalow 5’s Jacqui Tea Table is a bright and bold find that would bring a burst of color to the room. From the bold to the romantic, Serena and Lily’s Curvee Shelf Table is both functional and oh-so romantic. We love the clean lines of the Toto Cube Lamp, but it also has two functions in one—a table and a lamp, which emanates a perfect low-level light. We are obsessed with Restoration Hardware’s Vintage Spool Side Table. It’s functional, beautifully designed and provides a wealth of space for our much loved books. Who says functional can’t be fun? We love the 19th C. Bristish Drum Side Table. You may want to relocate this one when your little one is up and walking and able to make “music” with the table in the middle of the night. So you see, even the functional items can be an important and additive part of the design scheme. We know they say form should follow function, but we say the form should follow fun and fancy too! Nice ideas. 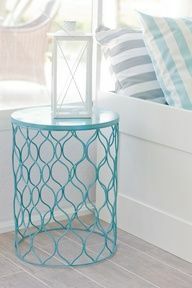 I can’t believe how many things can be transformed into a side table. I saw a tin trash bin on Pinterest that was made into one. Now, I go gaga over trash bins! Beautiful! What a great idea. Thanks for sharing! Yes, almost anything can be transformed into a side table: crates, barrels, wood pallets, even old tires! Even a bunch of suitcases can make a pretty neat side table!